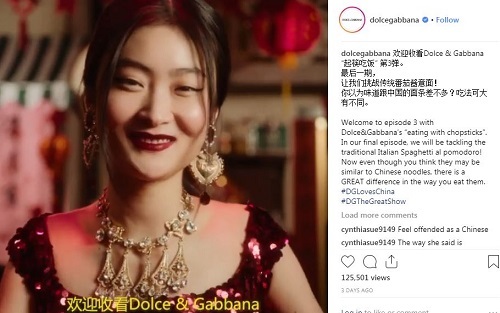 Italian fashion powerhouse Dolce & Gabbana has been accused of racism after publishing three ads which demonstrate a Chinese woman being told how to use chopsticks to enjoy Italian food, according to various reports. The brand has been slammed for its new “DG Loves China” campaign in China as the videos, which was posted on Weibo to promote the upcoming runway show in Shanghai on 21 November, show a woman eating large plates of pizza, spaghetti and a giant Italian cannolo pastry, while a male voiceover tells her what to do, according to CNBC’s report. Jing Daily said “Boycott Dolce” has been discussed more than 18,000 times on Weibo while some users have asked for an apology in both Chinese and English. Though Instagram has been banned in China, lots of Chinese people flocked to the brand’s Instagram account to criticise the brand and defend Chinese culture. Dolce & Gabbana is not new to controversies in China. In 2017, the brand published photos across different social media platforms, showing the underdeveloped parts and impoverished residents of Beijing. Chinese online citizens flocked to the brand’s Weibo account to complain about showcasing the underdeveloped parts of the city. They also said they would stop buying Dolce & Gabbana’s products in the future.